The competitive spirit of Capt. Archie Frazer-Nash was borne out in the development of the cars right from the early days of the GN. For over 100 years, from the first ever race by a GN at Brooklands on 12th October 1912, right up until the present day, GNs and Frazer Nash cars have competed successfully in most areas of motorsport. From their earliest prototypes, Ron Godfrey and Archie Frazer-Nash designed their cars for speed and performance. Racing and endurance trials were the backbone of the Works activity. Nearly every customer was competition-minded, and even if this wasn’t their initial intention the enthusiasm of the Works staff and other customers soon made them so. Customers who competed received priority. Only two chain-drive FN cars were ever built as saloons. Success in competition contributed hugely to the company’s advertising campaigns throughout the decades. Frazer Nash ownership became something of a cult and carried with it a certain cachet. Surviving cars are still competing in the UK and abroad, ensuring the enduring popularity of the marque. Before about 1930, Brooklands in Surrey was the only place in the UK where track racing took place. In October 1921 the Junior Car Club organised a 200 mile race for cars of up to 1500cc capacity and a separate classification for 1100cc cars. No motoring event for this engine size had been held before. GN Limited entered a car in the 1100cc class, driven by Archie Frazer-Nash. Archie won the race at an average speed of 71.54mph. On the last lap he recorded a speed of 77.45mph, as fast as fellow competitors in the 1500cc class. A special version of the Anzani-engined Frazer Nash gave the marque its most memorable victory of the 1920s. There were three Frazer Nash cars entered and it was the car driven by R.C. (Clive) Gallop which won the race. Archie Frazer-Nash was also entered but pulled two tyres off their rims in a disastrous skid. Alpine Trials were an incredible test of endurance for car and driver. They were held over five or six consecutive days throughout the Eastern and Western Alps. Teams and individuals competed for the coveted Alpine Cups and Coupe des Glaciers Trophies. In 1932 two TT Replica Frazer Nashes were entered in the 1500cc class, driven by Archie Gripper and H.J. Aldy Aldington. Both won a Coupe des Glaciers Trophy, awarded for not dropping a point or running without a single mechanical incident throughout the competition. Four Frazer Nash cars were entered on this occasion, including one driven by H.J. Aldy Aldington. For the third consecutive year he achieved a faultless run, earning him another Coupe des Glaciers. All four Frazer Nashes finished without a single penalty point, a remarkable achievement considering they were not part of a fully supported manufacturer’s team. First established in 1905, Shelsley Walsh is the oldest motorsport venue in the world still in use. A.F.P. 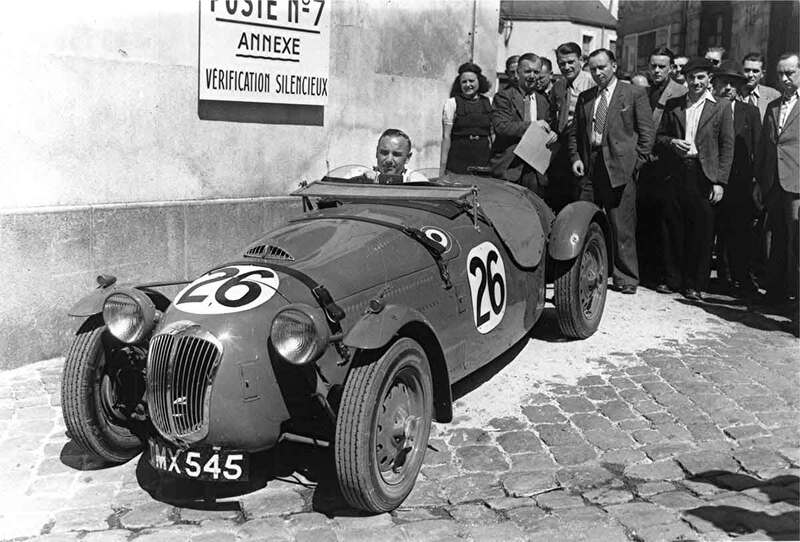 Fane was a hugely successful competitor in Frazer Nash cars, both on the race track and in hill climb competitions. Driving a Gough-engined single-seater Frazer Nash, Fane broke the hill record for the 1500cc class in a record time of 38.77 seconds. Before Silverstone became a Grand Prix circuit it was a Second World War airfield. After the war a few Frazer Nash owners used it to test their cars. 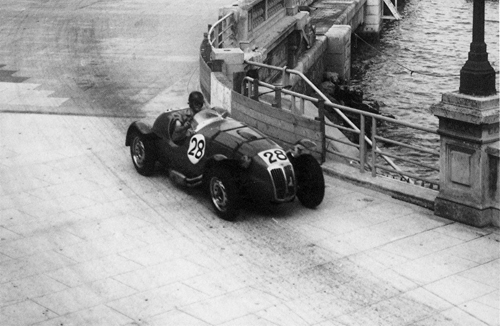 In 1947 a group of eight Frazer Nashes, alongside a Type 51A Bugatti and a Bentley, lined up and raced around the track continuously until, one by one, each car had to retire due to mechanical problems. During this unofficial race an errant sheep strayed onto the track and was unfortunately hit by one of the cars. This first ever race at Silverstone has always been known as ‘The Mutton Grand Prix’. After the war Frazer Nash developed a new car using the Bristol 2-litre engine. As motor racing began to get going again post-war, the new Frazer Nash proved to be very competitive at airfield circuits around the country, like Silverstone and Goodwood. But its best result in 1949 was finishing third at the first post-war 24 hour race at Le Mans, in France, with Norman Culpan and H.J. Aldington at the wheel. This really established this new breed of Frazer Nash in the eyes of the public. 1951 was the high point for the new post-war Frazer Nash. 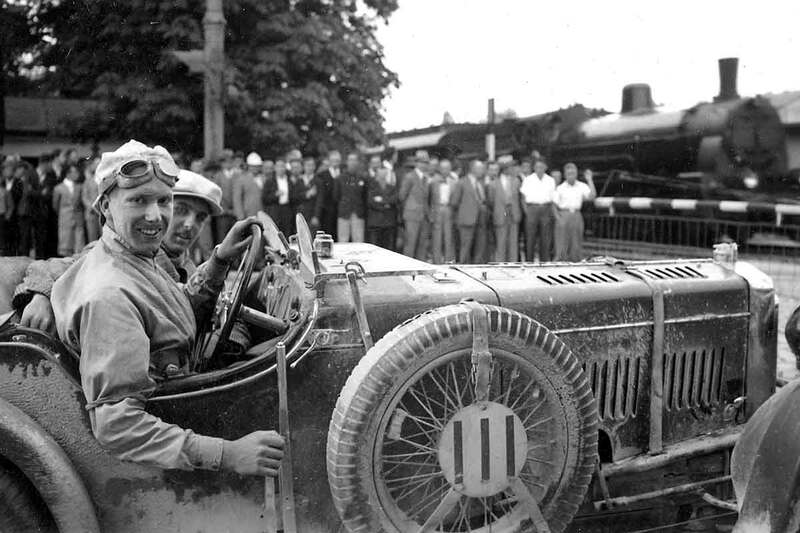 Franco Cortese, an experienced Italian racing driver, finished fourth in the 1000km race around the coast of Sicily, and then won the Targa Florio in the mountains near Palermo. 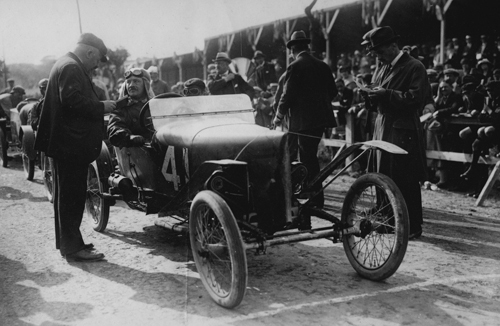 This famous race ran from 1906 to 1973 and this was the only time the race was won by a British car. Another Frazer Nash completed the race at Le Mans and then won a Coupe des Glaciers in the Alpine Rally (renamed thus after the war), proving the stamina of these cars. Meanwhile Stirling Moss won the British Empire Trophy in the Frazer Nash Le Mans Replica which resides in the Archives today.